Let’s talk about Travel Bucket lists today! How many of you have a Travel Bucket List? What counties or places do you have on your list? Well my bucket list started of fairly short and simple but lately it just keeps getting longer and longer! I keep adding places that people tell me about or places I read about. I may have to start to categorize them! As you all know, I love to travel, and any chance I get I grab it and go! Well actually I don’t just get up and go but you know what I mean, don’t you? What I’m getting at is that I do try to travel whenever I can whether it is me with my mum or friends or even my husband, I’m there! But I always have in mind my finances too! It is hard when both me and my husband go traveling as we also have to consider the dog hotel costs for both Sasha and Wolfy. I always say that there is no harm in dreaming and keeping a bucket list of place you want to see in the hope that one day you might get that chance to actually go and see these wonderful places around the globe! I never stop dreaming of the places I want to see and the things I want to do! Nothing is impossible! Everything IS possible! You just need to find a way to make it happen. 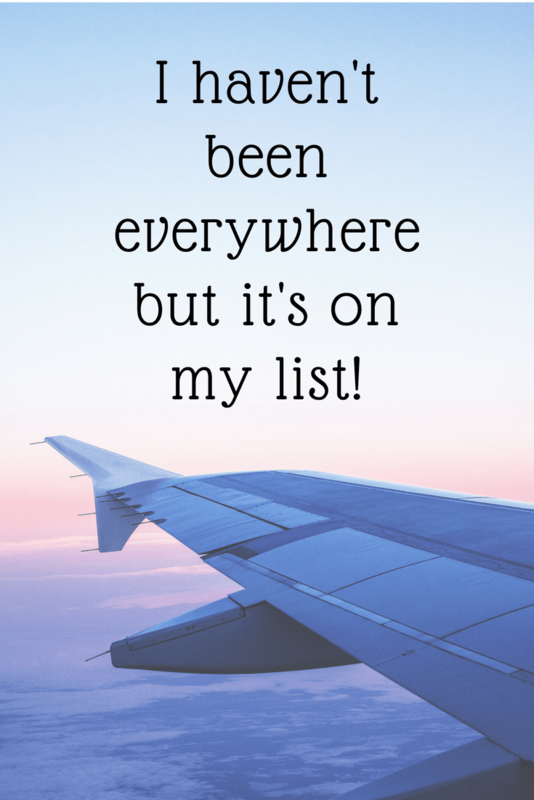 While I was typing up My Travel Bucket List below, I actually noticed that I did indeed travel to many places even though I feel like I didn’t! There are so many places to go and we only have a life time to see them, I guess that is why I feel like I haven’t travelled much. Actually thinking about it now, I am pretty lucky to have been able to travel to all the places I have been! Have you already written up your Travel Bucket List? If you haven’t then I think you should get started! It is never too late to start and don’t worry if you start off with only a few places. Your list will grow, trust me! It will always grow no matter how many places you visit, there will always be another place you will want to see. It’s sort of addictive you could say. As for those of you who already have their list, let’s see it or at least tell us a few of your places written on the list! Please note that the places in purple are the ones I have been to and the rest are the ones I would like to someday go! For those of you who do not know where to start in making their own Travel Bucket List, here is my free template! 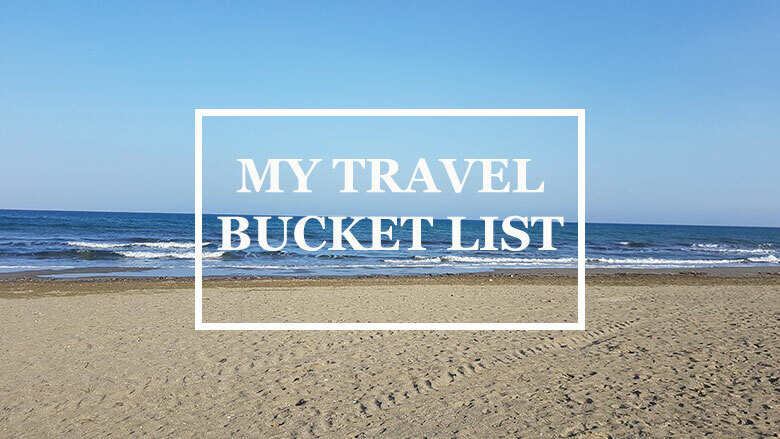 Have a look and let me know how many places your bucket list has in common with mine! I’m always looking to see if I can travel somewhere new and interesting and maybe also within budget! This is an incredible list of countries. A lot of these countries I also want to visit a few of these countries. 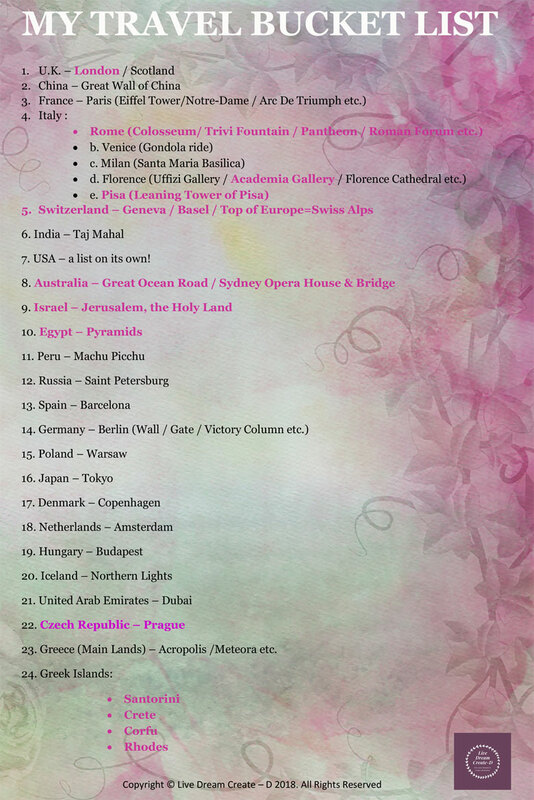 Very interesting that we have the same countries and cities on our lists! Hope you get to visit them soon! Great!! Traveling ’round the world. I’ve never been those places either.. Hope someday there will come the chance.. I am sure that you will travel soon enough. Just keep the faith and maybe set a goal to where you would like to go to first. Jamaica is not the only one off my list but as I said it just keeps growing! Jamaica will be on added on my list. Have we met? It’s like you created the travel bucket list of my dreams! Can’t wait to start marking them off my list. Nope we haven’t met, but it’s a pleasure meeting you now! I am glad you liked my own bucket list! I hope you printed the free template and started that list of yours! Now you can have a list to see and work at it. Set your goals and I am sure you will see many places. Sometimes we don’t realise just how many places we have visited until we actaully write them down.